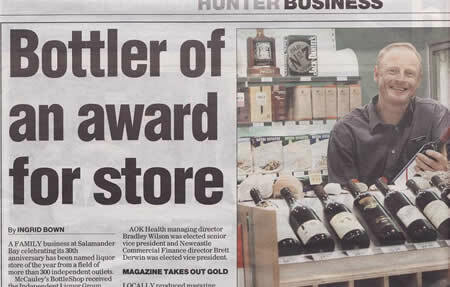 McCauley’s Bottle Shop is a quality liquor store in the premier location of Salamander Bay, Port Stephens. Our vision is simple; Old fashioned family style service. Though our beginnings may have been humble; the McCauley business is now known amongst its competitors as the store that raises standards. Locals still fondly recall the early days when Jack and son Alan opened the business. In those days, Jack was a real identity in the liquor trade having been a well known publican and personality at the Bank Hotel, Dungog and later the Spinning Wheel Hotel, Raymond Terrace. As Port Stephens grew as a popular destination, so did Alan’s family. Wife Jo and children Lisa, John and Emma warmly remember many Christmas days helping Dad at the shop by bagging ice and filling the cool room with beer. 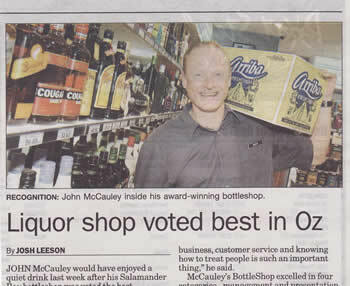 Today, McCauley’s Bottleshop operates by the same family values……and there is always a McCauley around to say g’day.